A couple of weeks ago, I went down to Key Largo to play some more with the Aqueon and to put in some scooter free diving. One day, the boat headed out to the wreck of the Speigel Grove. I used the Aqueon for a few shallow dives choosing to stop at around 80 ft.. I then changed over to the scooter, a fairly slow Seadoo VS. Most of the dives were around the central hold area shown above. The wreck originally rested on its side. 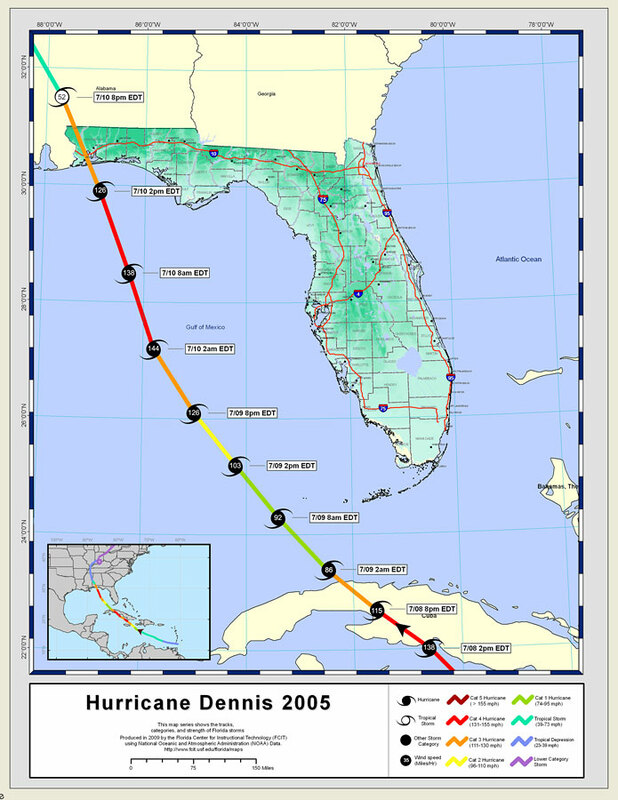 Hurricane Dennis placed it back on even kneel. The 510 ft. vessel is resting in a maximum of 140 ft. of water with the deck at around 100 ft.. In the past I rigged a tee seat for operating scooters on my old Techna, it was pretty fast. It was the only way to efficiently equalize. The Seadoo is slower and allowed me to equalize while still underway by wedging the unit. Fortunately, there was little current and visibility improved through the dive to a bit over 100 ft. So, after breathing up, I descended down to the decks of the Grove about eight to ten times to between 100 and 115 ft.. It was fairly straight forward to do this and at times I would motor around 50 ft. horizontally along the deck. After a while, I started to wonder if it might not be too easy, i.e. could be some problems lurking. After a couple of dives it occurred to me that I could have some deco issues. I therefore increased my surface interval to at least ten minutes between dives. After six or seven dives I noticed some minor light headedness. I was particularly careful while breathing up and during recovery to try to avoid problems. I think I could have drank more and will be sure to do so next time. Anyway, it was an enjoyable sensation with no negative symptoms following the dive. - You don't want to be further down than you are able to ascend from without aid of the scooter. If something happens to it, you ditch the scooter and ascend. I've decided to rig a small pony bottle across the small of my back just in case. Might even use it for a safety stop at times. - Some have said to be sure to ascend particularly slowly in the last 33 ft. and even to stop for a while there to off gas. One diver mentioned doing an O2 safety stop at the end of the day, could make an important difference. - As always, hydrating thoroughly is advisable. - Others have indicated some issues with very rapid ascent, faster than I could go with the VS scooter on the order of almost 10 ft. per second. I think the VS was moving at less than 1/3 that speed. Anyway, all that speed can lead to barotrauma issues and disorientation or vertigo due to middle ear issues. So, motoring at reduced speed on ascent seems to be prudent. - Still others talked about lung and trachea squeeze at depth, perhaps a bit deeper than I was hitting on this series of dives. It was advised to increase diving depth slowly over weeks to try to allow the body to acclimate to the new stresses. - Another warned of hitting the wreck while under power. You could easily knock yourself out going fast on a scooter. A helmet is a good idea to try to reduce impact damage along with slow operating speeds and careful vigilance to avoid slamming into stuff. It is pretty easy to hit things motoring around a wreck, so have a care. - NEW, Don't scooter free dive in strong current with poor visibility! Reasons why show up in the video below. - It doesn't appear to be a good idea to mix SCUBA diving with this sort of activity. We still don't know a lot about residual nitrogen from SCUBA diving and impacts of free diving on promoting DCS other that it sometimes does just that! Some advise treating free diving like flying, only do it once you have cleared out all residual nitrogen or 24 hours or more after your last SCUBA dive. Seems strict but DCS hits are no picnic and worse tend to reoccur even easier at the same locations. - Have your buddy carefully examine you for signs of cyanosis upon surfacing and other unusual indications. If you start to feel odd, increase surface interval for recovery or call it a day as indicated. Anyway, despite scooter free diving being fairly old, I was doing it at times in the '70's, I wasn't going anywhere near this deep or repetitively, it seems like we are still learning about it. As much fun as it can be, I suspect there are a series of obvious and latent hazards posed by the activity that bear further investigation. So, have a care out there, there is still more to learn and avoid about this intriguing variant of diving. If you have constructive ideas, experiences or suggestions, let's hear them. Last edited by RickI; 03-12-2018 at 08:38 PM. I would also think that repeated deep bounce dives would be risky, even when free diving. However, the free diving depth records are set this way, and they don't seem to have any problems (do they? I am not sure). Interesting questions you are seeking answers to. I did a lot of deep cave diving and am well aware of the risks involved with deep diving but hadn't considered those of free diving. I am sure they are probably not all that different, but rather take longer to become significant. There is precedent for free diving DCS, they even have an old special name for it, Taravana. It was named after the Pacific Islanders that were first discovered to have DCS symptoms from repetitive, deep free dives. I understand scooter free divers may have even suffered DCS already. Most free diving records although involving extreme depth rarely also involve near term repetition. It is a real issue, one that deserves careful consideration particularly for guys that have already had DCS from SCUBA diving. I would think it would be fairly easy but also potentially hazardous to do numerous free dives to 100 to 120 ft. in a fairly short period of time without exercising some precautions. Still trying to figure out what reasonable precautions would be the most effective. Went back to shoot video while free diving on the Speigel Grove on March 16, 2008. I was so blown away last time figured with a better Apollo Evolution scooter and video camera should come up with some intriguing images. Wasn't expecting turbid water to be carried into the Straits from Florida Bay by southwest winds. Southwest winds usually clean the water up off the mainland. Live and learn. Big thanks to Captain Slate of the Atlantis Dive Center in Key Largo, FL. Slate and I go way back. We first met at our dive instructor ITC at FAU in 1976! He became a diving legend and I became ... still trying to figure that out?! I'll be back when visibility is superlative and try to grab images for another video, round II! Last edited by RickI; 04-19-2008 at 04:33 AM. Last edited by RickI; 03-12-2018 at 08:30 PM. Hurricanes have long done significant damage and change beneath the water as well as above. 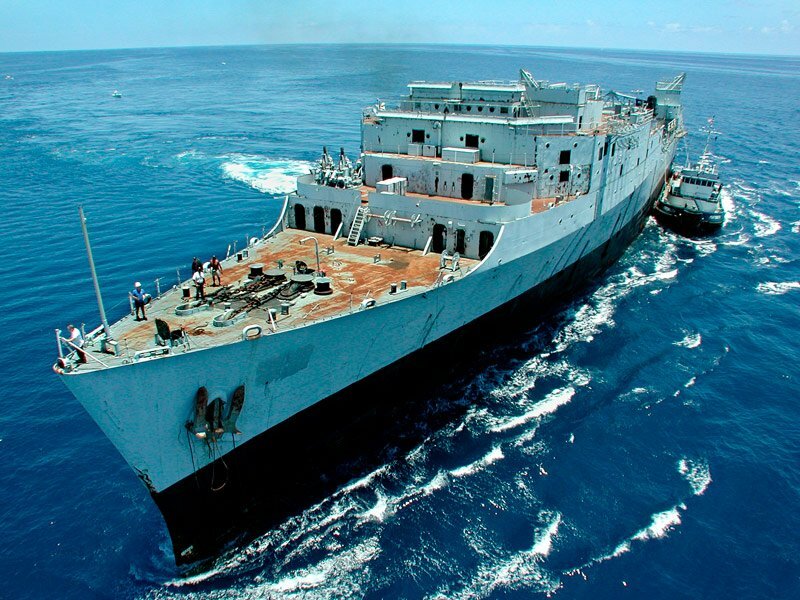 The USS Spiegel Grove, at 510 feet the largest wreck sunken in the Keys to the point in as an artificial reef dropped accidentally in May 2002. It initially settled upside down. Resolve Marine pumped air into the wreck, attached lift bags and rotated it on to its side. Resolve Marine's plans for righting the inverted wreck. 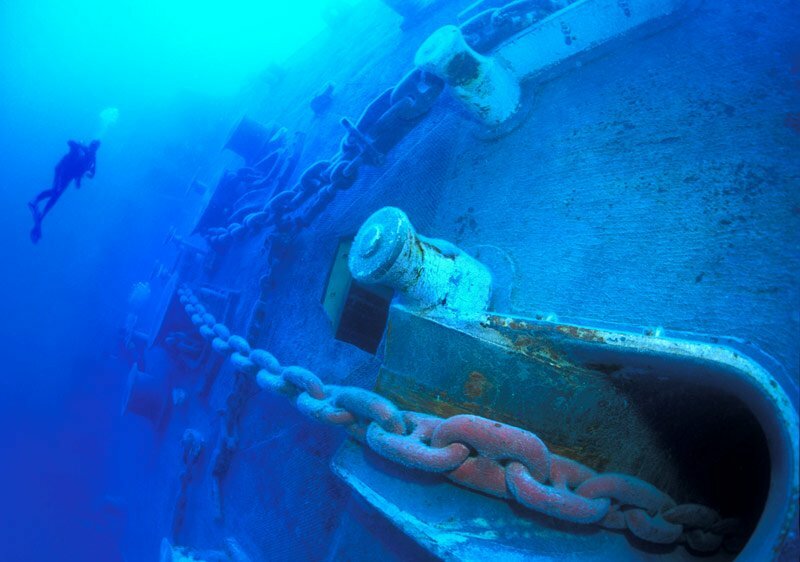 I recall diving the wreck after it had been rotated on to its side with all the cranes and other deck apparatus pointed out horizontally into the water column. It was aligned roughly north to south and with the impact of the Florida Current, a trench was excavated in the sand at 130 ft. by the starboard side the wreck. The wreck was like this for three years until Hurricane Dennis spun up from below Cuba, with the eye passing west of Cuba and landing just west of Pensacola, FL..
Hurricane Dennis on July 9, 2005. 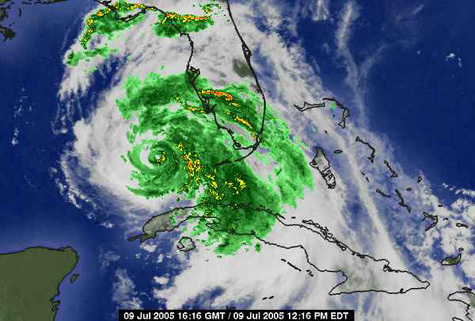 On July 9, 2005 when the eye was west of Key West, the waves and currents from the Cat. I hurricane, shoved the wreck over into the sand trough, righting the vessel. The eye never came closer than about 220 miles from the wreck which lay in the leading right hand quadrant but well beyond hurricane force winds. Last edited by RickI; 03-12-2018 at 08:35 PM.